Trees belonging to the subtropical ficus genus are generally low-maintenance trees but do benefit from regular doses of fertilizer. Light doses of a complete fertilizer, such as a 10-10-10 ratio, roughly every month while your tree is actively producing new tissues, is ideal, according to Deborah Brown at the University of Minnesota. Careful attention to the trees' seasonal development, growth rate and light levels will help determine the best annual feeding schedule for your ficus. 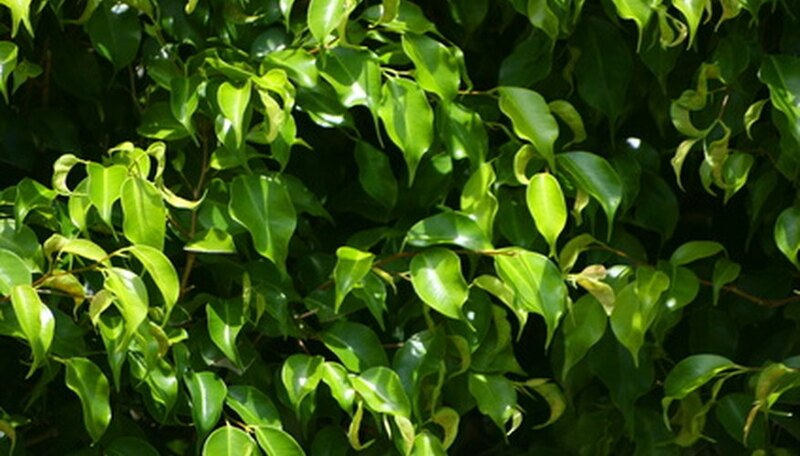 Feed your ficus tree during its active growth phase, which in most climates is the spring, summer and early fall. Fertilize ficus trees through the fall and winter if they grow outdoors in warm climates or receive bright sun or artificial light year-round. Feed at intervals of every four to six weeks. Apply a slow- or fast-release complete, balanced fertilizer with a guaranteed analysis of 10-10-10 or similar ratio. Follow the label dosing directions but cut the amount of fertilizer to be applied by 50 percent to prevent burn and excess buildup of excess mineral salts in the soil. Cast the fertilizer evenly around the root zone of the tree from a few inches out from the trunk to just past the drip line of the canopy. Refrain from digging the fertilizer into the soil as this will disturb the trees' shallow roots. Water the fertilizer into the surrounding soil, drenching the soil to a depth of at least 1 to 2 feet or to at least half the depth of the pot, if the ficus is container grown.